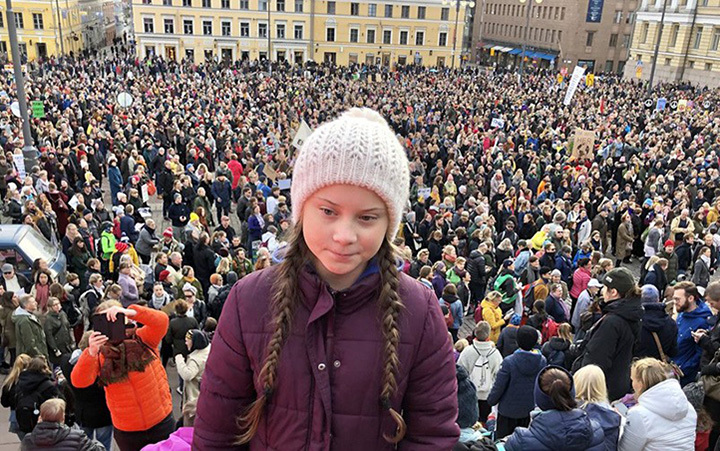 Greta Thunberg, above left, after addressing 10,000 people in Helsinki, October 20, 2018, at the largest climate march in Finland’s history. Photo: Svante Thunberg (Greta’s father) via Twitter. The new face of climate activism may be young, but she is determined, and her direct approach is bringing attention to the urgency of global climate change. Greta Thurnberg, a 16-year-old climate activist from Sweden, does not mince her words when she speaks about the action needed to address climate change. She does not shy away from boldly addressing business leaders, or government representatives, or crowds in the tens of thousands—armed with facts and the stark reality of what she, and everyone on planet Earth, will face if immediate action is not taken to drastically reduce carbon emmissions. Last year, at only 15, she began leading weekly climate strikes on the steps of Swedish Parliament, missing school on Fridays (with the approval of her parents) to make a statement. The vigils are ongoing and have spread across Europe, using the social media hashtag #FridaysForFuture. In January, she spoke on a panel at the World Economic Forum (WEF) in Davos, Switzerland, alongside such heavy-hitters as Bono (frontman of U2), reknowned conservationist Jane Goodall, former UN climate chief Christiana Figueres, and panel host and billionaire Marc Benioff. She directly addressed the elite attendees, seated just feet in front of her, telling them that they were among those directly responsible for the climate crisis. As scientists now say we only have about 12 years left to drastically reduce carbon emissions and prevent catastrophic climate consequences, it’s time indeed.